New data reveals similar trends in nine major cities. 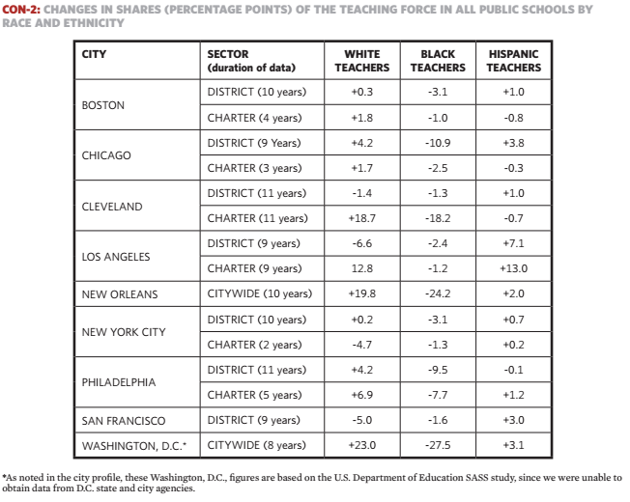 As if there wasn’t already a deficit, the share of black public school teachers dropped in nine major U.S. cities, including New York, Los Angeles, and Washington, D.C., between 2002 and 2012, according to a new report from the Albert Shanker Institute. The Shanker Institute, a think tank backed by the American Federation of Teachers, notes that this is a problem because students, particularly students of color, do best when their teachers are able to relate personally to their experiences and cultural heritage. Students score better on tests and are more likely to stay in school. All students stand to benefit from a teaching force that reflects the nation’s population, the report adds, because it exposes them to different races and customs, which can help reduce biases and stereotypes later on. So it’s in the nation’s best interest to cultivate a less-monolithic teaching force. Yet, according to the Shanker Institute, the percentage of teachers of color has only risen nationally from 12 percent in 1987 to 17 percent in 2012. The main issue isn’t hiring, it’s attrition. Teachers of color are far more likely to leave the classroom than white teachers. One reason is that they’re disproportionately likely to work in urban, high-poverty schools that often pay less, and where teachers say they lack control over classroom decisions. A separate report by the Center for American Progress that relies on federal education data found a $16,000 discrepancy in teacher salaries between high- and low-poverty districts. Districts, the report points out, are becoming more, not less, segregated. The average black student attends a school where two-thirds of his classmates are poor, almost double the rate for white and Asian children. About 15 percent of black and Latino children attend schools where white children make up between zero and 1 percent of the student body. While the number of black teachers declined in the nine cities studied, the share of Latino teachers generally remained the same or rose slightly. Still, the modest growth in Latino teachers is not enough to keep up with the rapid growth in the Latino student population. In New York, for example, the share of Latino teachers has risen slightly to 15 percent, but Latino students make up 40 percent of the study body. Sixty percent of teachers are white, but just 14 percent of the students are white. Shanker highlights a number of programs working to increase the number of teachers of color and their strategies. While varied, their tactics have a common theme. The report offers several recommendations, including requiring the Education Department and states to collect data on the race and ethnicity of the teaching force, and investing federal and state dollars in teaching programs at schools that target students of color—historically black colleges and universities and Hispanic-serving institutions among them. But Casey acknowledges the challenges in turning such proposals into reality. States and districts don’t want to reveal data that would “open them to public scrutiny.” The other challenge is convincing lawmakers in a time of tight budgets that teaching programs deserve more funding. Clearly, there’s no easy fix. But the nation is becoming less white. That fact is not going to change. If, as the research suggests, the students who will be the nation’s leaders and workers in the coming years learn better from a teaching force that reflects the population, something has to change.